Sunlit sunken entrance with glazing. York University Subway Station, Toronto, Canada. Architect: Foster + Partners, 2018. Photographed by doublespace, York University Station develops themes first explored in underground stations for Canary Wharf in London and the Bilbao Metro in Spain: its design considers the surrounding public space and connections to the city, and uses natural light to intuitively guide passengers from the entrance down to the platforms. 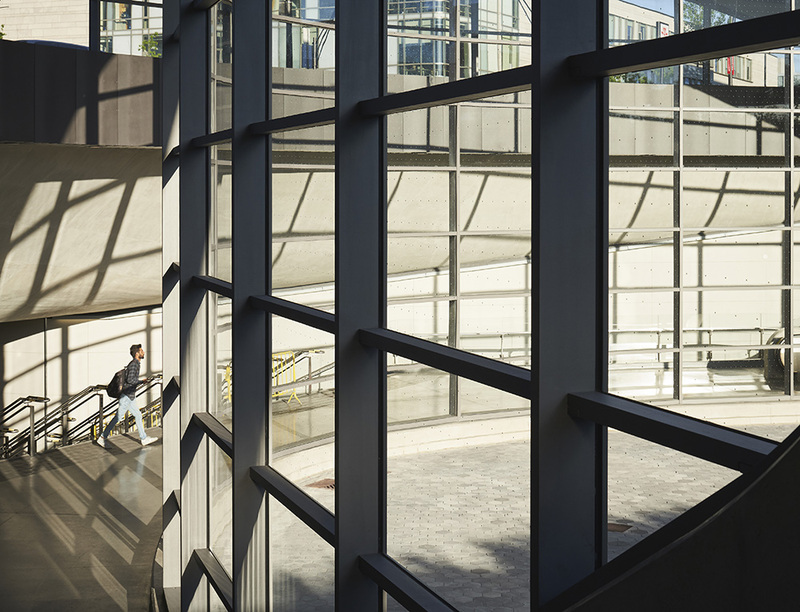 More than a functional station, this building creates a dramatic moment. Located on the central axis through the campus, alongside the prominent Vari Hall, its striking roof canopy provides a new ‘front door’ for the university. The station’s presence within the green setting of the Harry W. Arthurs Common is discreet. The building is sunk into the landscape with the entrance placed at the base of a landscaped amphitheatre, where it is sheltered beneath a striking aerofoil roof canopy – the underside of the canopy is highly polished metal, reflecting the movement of people beneath. The double-height ticked hall is glazed on every side and filled with natural light.